As experienced Digital Printers operating in the Thornaby, Stockton-on-Tees area, Holder Print Ltd offer imaginative solutions and ensure we provide you with the definition and sharpness you deserve when receiving digital prints. Lithographic Printing is best used when you are looking to print in bulk and have materials that are going to be distributed widely. No quality is sacrificed but the process is quicker and cheaper than standard printing methods. 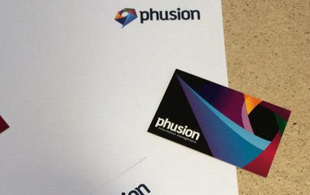 Are you looking for something different this time round when you need more business cards? We can come up with thoughtful and quirky designs that are sure to catch potential customers eyes during that all important conference. At Holder Print Ltd we can provide you with graphic design services. If you are lacking imagination or have ideas that need putting into practice, we can do this for you from our base in Thornaby, Stockton-on-Tees. Get in touch today. 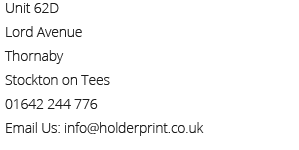 We are professional, dedicated & friendly printers operating throughout the Stockton-on-Tees area. Holder Print Ltd of Thornaby know what it takes to produce high-end results time and time again... We work WITH you, not FOR you! If you would like to see samples of our work you can get in contact with us today and we will send you a full portfolio showing recent samples of the material we have provided for others. As you can see below, we look to deliver high quality printing materials and will never sacrifice quality for quantity when it comes to larger jobs. As a company who strives for excellence, we believe that customer service is the key to success. We get to know our clients and find out what it is they truly want. By doing this, we can get a firm grasp on the angle they are looking to advertise or promote from. By doing this, we are showing our clients that we care about their needs, and showing them we are willing to take their ideas on board to produce, fantastic, artistic and creative results. If you live in Thornaby or the Stockton-on-Tees area, Holder Print Ltd have all the answers for you. Call us on 01642 244 776 and ask for a custom quote. We can create the perfect print for you. Below are some recent examples of our work. Contact us today to request more samples of what we do! 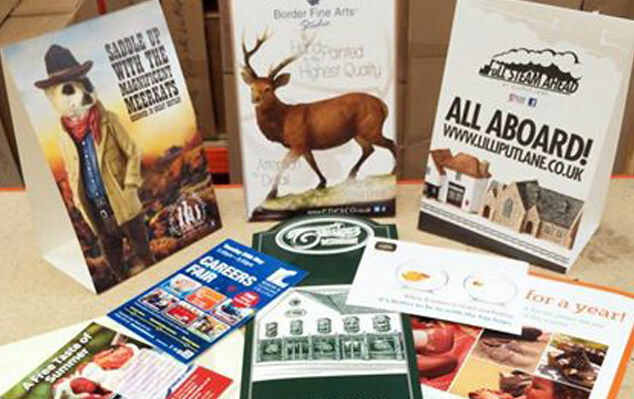 Leaflets, Flyers, Brochures, Menus, Posters, Advertisements, Signage, Vehicle Graphics and more, right here at Holder Print Ltd in Thornaby, Stockton-on-Tees. Make sure you stay ahead of your competitors and advertise your business effectively using only the highest quality printed materials! 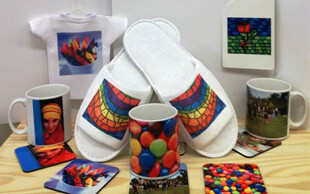 Holder Print Ltd can provide you with printed promotional gifts so you can market your business effectively. With printed coasters, mugs, clothing, mouse-mats and more, you can raise awareness and build your brand in an effective way. We have a team of graphic designers who can help you with your personalised business stationery and other marketing materials. Do you need help building a brand or want your business cards, compliment slips and letterheads re-designing? Welcome to Holder Print Ltd of Thornaby. Your one-stop-shop for all things printed!